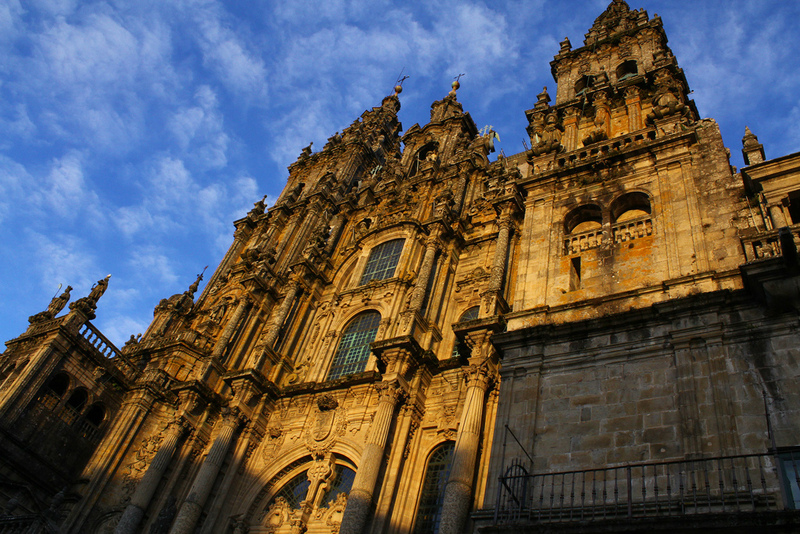 The north western Spanish city of Santiago de Compostela is located in the region of Galicia and is a unique city, because it attracts thousands of pilgrims from across the world who come to walk the Camino de Santiago. Even without the Camino de Santiago however, the city is both fascinating and historic and offers lots of unique experiences for visitors. Whether you’re religious or not, attending mass at the Santiago Cathedral is quite an experience. For many it’s the culmination of the month-long hike along the Camino de Santiago pilgrimage route. Here you’ll see pilgrims of many different backgrounds, ages and ethnicities join together to celebrate their victories. Some arrive hobbling with injuries, while others hug or cry with emotion. It will be quite unlike any other mass you’ve ever been to. Also inside the cathedral is the famous Botafumeiro. Weighing 53 kg (117 lbs) and measuring 1.5 m (4.9 feet), it is one of the largest censers in the world, and is suspended 20 m (65 feet) from the ceiling of the cathedral. On special occasions or during certain masses, the Botafuemeiro is released by team of eight tiraboleiros who swing it across the cathedral via a series of ropes and pulleys. It can swing across the crowds at immense speeds of up to 68 km/hr (42 miles/hr). It is thought that the ritual began to cover up the sweaty smell of all the pilgrims who arrived here. 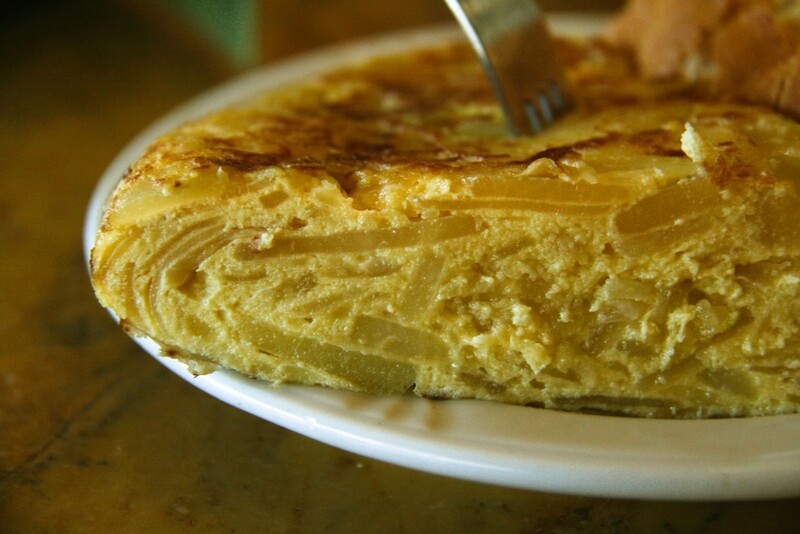 Many say that Galicia make Spain’s best tortillas (Spanish omelettes). Large, almost always fresh and very juicy, they’re a must try while you’re in the city. For the best and biggest tortilla you’ve ever seen, make your way to the popular Bar La Tita, located among the narrow streets of the Old Town. A casual, yet crowded place, tortillas are made fresh to order. Even half a tortilla here can easily feed six hungry pilgrims. If you haven’t reached Santiago de Compostela by walking the Camino, then learn what all the hype is about by walking just a small section of it. Take a bus or a taxi to A Rua, the last town before reaching Santiago de Compostela, and walk the last 18 kilometres into the city. It’s quite the experience and is sure to get you hooked and you’ll want to return next year to complete the entire route. The Tarta de Santiago is a delicious Spanish dessert, which is a kind of sponge cake made from ground almonds. You can taste it in many places in Spain, but of course the best place to try it is in the city of its origin – Santiago de Compostela. The tart usually features the cross of Saint James or Santiago, and can be found in restaurants and bakeries across the city. The Galeria de Jose Cao Lata sits on a hill high above the city and is located along the Camino de Santiago route into the town. Jose Cao Lata is a sculptor and has spent most of his life filling his garden with amazing stone sculptures. Each of his sculptures portrays a political or social message and he’ll be happy to share them all with you. This is certainly one of the most unique outdoor galleries you’ll ever visit. Students of Santiago de Compostela University refer to the grand library of the geography and history faculties as Hogwarts, because of its resemblance to the huge library at Harry Potter’s School of Witchcraft and Wizardry. The library was inaugurated in 1924 and is filled with glittering chandeliers, gilt-edged wooden shelves and elegant furniture. Visitors are also free to enter and look around. A foliada is a traditional Galician musical performance. Its origins come from Celtic music and include instruments such as gaitas (bagpipes), pipes, violins and flutes. You can find this music being played in various traditional bars across the city.